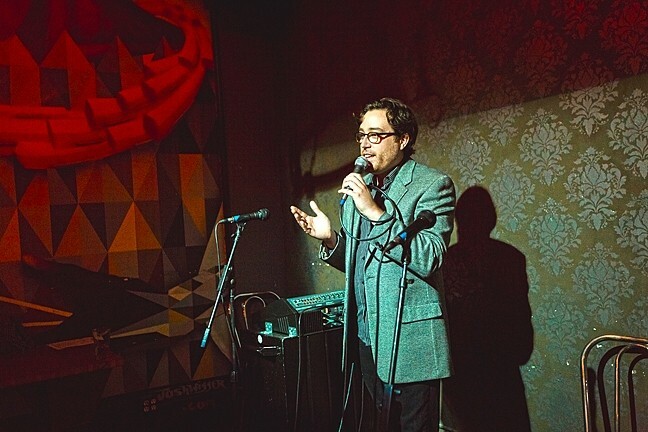 When Kreuzberg Bar and Events Manager Mitchell Shira began planning the lounge’s first open mic night in 2013, he was overtaken with a sudden pang of anxiety. OPEN SESSION: A mix of nerves, heart, and creative expression come together to make Kreuzberg Lounge’s weekly open mic night special. From left, local musicians Sam Flynn, Christiana Newcomb, and Kevin Finnesey of Beyond the Bridge spill their guts during the two-year anniversary show held on Sept. 30. Anyone who has spent time playing open mic nights understands Shira’s reluctance wholeheartedly. These are often fresh, fragile performers—some of whom have never strummed a chord in front of another soul as long as they’ve lived. Bombing is part of the deal, and everyone—including Shira—has crashed and burned at some time or another. It’s an open mic rite of passage. For audience members, witnessing these moments can be like listening in on an AA meeting or therapy session. There is a lot of vulnerability involved, and with vulnerability comes truth. Striking, can’t-look-away, life-affirming truth. Shira found his own musical footing in 2009. The UCSB graduate had just moved back to his old stomping grounds of SLO (he grew up in Los Osos) and began his creative journey in earnest. Like the start of any romance, there are always a few awkward first dates. 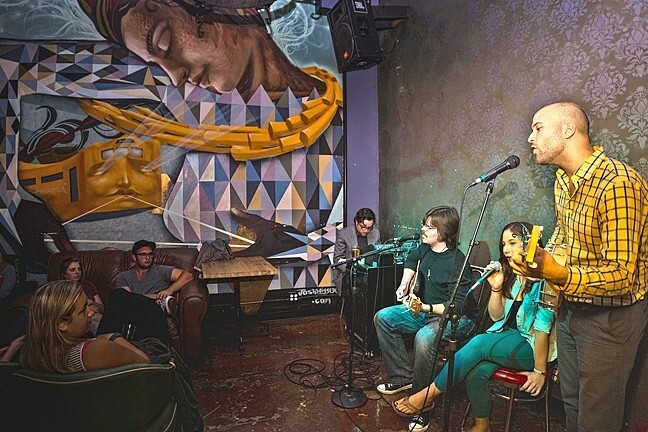 Open mic night is that first, blind date for so many musicians looking to hone their skills, share their feelings, and connect with other artists. Over the past two years of hosting Kreuzberg’s weekly Wednesday open mic, Shira has seen bands form, careers take off, and talents surge. YOU’RE UP NEXT! : Shira’s open mic night goes off with a bang each Wednesday evening at Kreuzberg Lounge from 9 to 11 p.m. To procure your 10-minute slice of stardom, sign up in person and ask for the list at Kreuzberg Coffee, 685 Higuera St. in downtown SLO. New sign-ups begin each Monday morning and are first come, first served. Pushing through that fear and uncertainty allows local comedians and singers a chance to make that first, shaky step toward confidence. Along with institutions like Toan’s Open Jam at Frog and Peach, the Poetry Church in Morro Bay, and Comedy Night at Atascadero’s Tent City Brewing Co., the open mic is about inclusion. Popular touring bands, street poets, and even comedy heavy hitters have all grasped the mic at one time or another. Each open mic night features eight slots. Each slot gets the same 10-minute set. “One time we had a professional comedy writer in LA come in, and he showed up one night and read passages from books he had picked up at Phoenix Books, and made it funny,” Shira said. “We had a lot of comedians signing up every week, which was great, but we only have a few slots, so we are now doing a weekly comedy night every Friday.” Local comedians Evan Fox and Michael Zalusky have helped bring laughs to the lounge’s dimly lit chamber. ROCK THE MIC: Kreuzberg Lounge’s weekly open mic night turned two years old late last month and continues to unfold each Wednesday from 9 to 11 p.m. hosted by Mitchell Shira (pictured). “Sometimes it’s a little hard to sit through because it’s uncomfortable for the performer and that makes it uncomfortable for the audience, but I really try to lighten the mood and make the room really easy,” Shira said, adding that he’s working on an open mic “theme song” to play before each show. Interested in giving it a try but too chicken to sign up? Remember: There is beer and wine available from the Kreuzberg Lounge bar. A little liquid courage never hurt. Hayley Thomas is shaking in her boots but is going to get up there anyway at hthomas@newtimesslo.com.